The Gasometer City in the rather suburban district of Simmering are a cluster of four enormous gas tanks that were built in the 19th century. The buildings are not only a testimony of the economic peaks that the Austrian Empire experienced in the Gründerzeit, they are also a fine example for the implementation of old buildings into modern architecture and 21st century needs with respect to urban living space. The four gas tanks, which are clearly visible to people who arrive in Vienna by plane and then take a bus or car to the city centre, are home to a multi-screen cinema, art galleries, shops, apartments and a student′s hostel. When the Gasometer were opened in 1896, they were among the biggest in the World and Vienna was at its prime in terms of self confidence. Later, the for gasometers were supplemented by a fifth gas tank. The gas that was stored in the enormous tanks was primarily used for street lights and - later - private households. The brick cylinders have a capacity of 90,000 cubic metres each - I have no idea how much that is, but it sounds impressive. Each gasometer is 70 metres high and 60 metres in diameter. The Gasometers were used for a relatively long time - until 1984. The fifth, younger tank was demolished afterwards, the four Imperial ones had been listed in 1978. Modern tanks, by the way, store gas under pressure in liquid state, which makes large gas tanks redundant. After 1984, there were several ideas what to do with the gasometers - but for a long time, little happened. The gasometers became one of Vienna′s most popular clubbing venues. Apparently, the acoustics were particularly cool in the huge, empty tanks. A James Bond movie was shot partly in the Gasometer, too. The current Gasometer City is the result of an architectural competition that was held in the 1990ies. 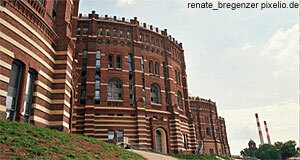 In 1999, the refurbishment started and the first "new" gasometer opened only in 2001. They are "named" with letters, ranging from "Gasometer A" to "Gasometer D". Each of them was designed by a different architect, all rather well-known people in the small world of Austrian architecture: Wilhelm Holzbauer, Wolf D. Prix for Coop Himmelb(l)au, Manfred Wehdorn and Jean Nouvel. All "inner structures" of the Gasometer were demolished and only the façade and the roofs were preserved. The total cost of the project was some 175 million Euros, resulting in the creation of approximately 600 flats, some office space and commercial areas. This does not include the costs for building a U3 subway station that connects the Gasometer City with central Vienna. There are approximately 1,500 people who live in the Gasometer City, and they are known to bond in a typically Austrian way: Developing a tribal feeling of belonging. The Gasometer City is seen as a village within Simmering, thanks to shopping malls, multi-screen cinema and a great view from the "Skywalk" (a bridge between Gasometer C and Gasometer D), it has become an attraction for visitors with an interest in modern architecture. Less successful are the shops and commercial areas: By late 2007, approximately one third of the commercial areas in the Gasometer City were not used. As a result, the SEG (one of the companies involved with the re-development of the Gasometers) went bust. Time will prove if the Gasometer City has the potential to become a worthwhile investment - by now, they certainly are an attractive addition to Vienna′s portfolio of modern real estate. Nearby attractions are rather limited - the Zentralfriedhof Cemetery and the Cemetery of St. Marx are popular sights not far. For another example of Industrian Historicism in Vienna, see the Wasserturm Favoriten.